I had some apprehension about biking to work last Wednesday. I woke up with a little knee pain and went back and forth in my head about whether or not to bag it. I finally decided to just go for it. 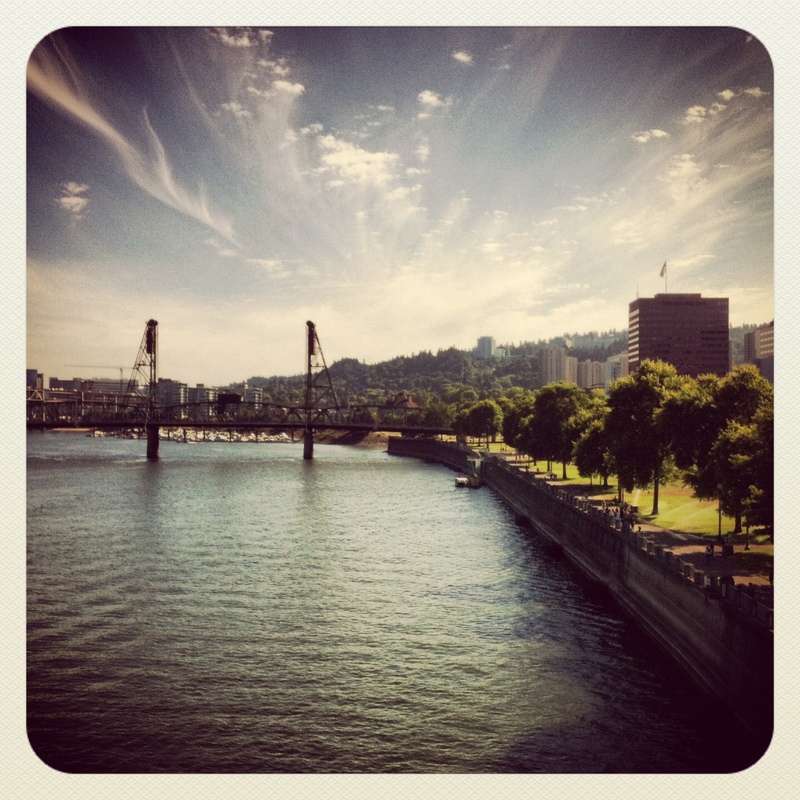 I foam rolled before I left the house and then drove to Sellwood to bike part way to work. The ride was actually really good. My knee didn’t bother me at all. I forced myself to take it easier and go a little slower. 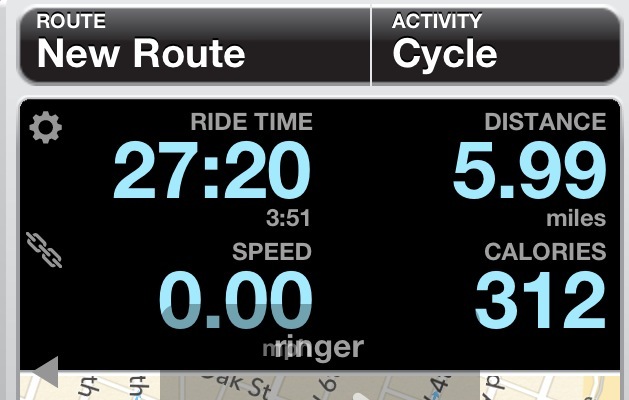 I did push it once to pass someone that was going too slow, but other than that I did okay. It was a nice start to the day. 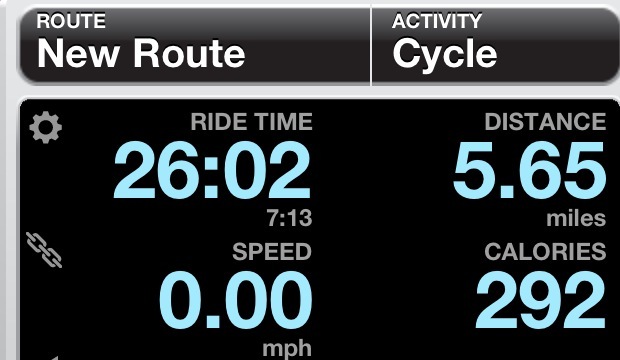 My knees were achy throughout the day but the ride home wasn’t bad–knee wise. On the other hand, the wind had picked up and it was the worst I’ve experienced in the afternoon. I’m used to the wind tunnel in the mornings on the Springwater trail, but the afternoon? This was a first. Not only that, the wind was HOT. 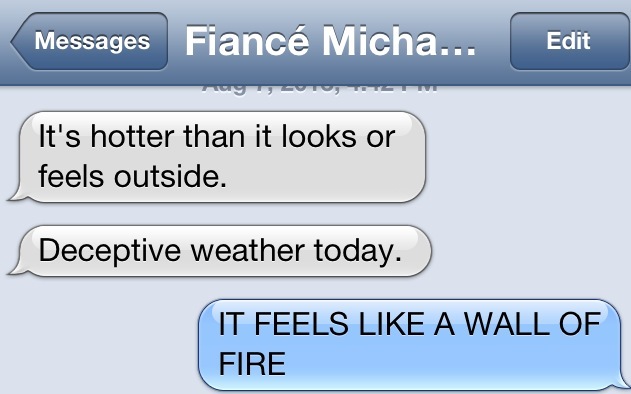 It was probably only 87 degrees that afternoon but the wind was super hot and felt like a wall. The wind was so strong that I felt almost like I was biking backwards. It was very, very difficult. My heart rate was super high for me (175!!!) during this ride. That was shocking. 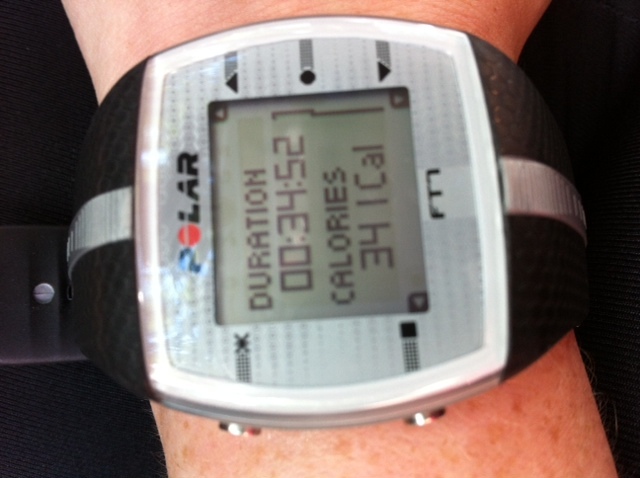 Definitely burned a lot of calories on that short ride! 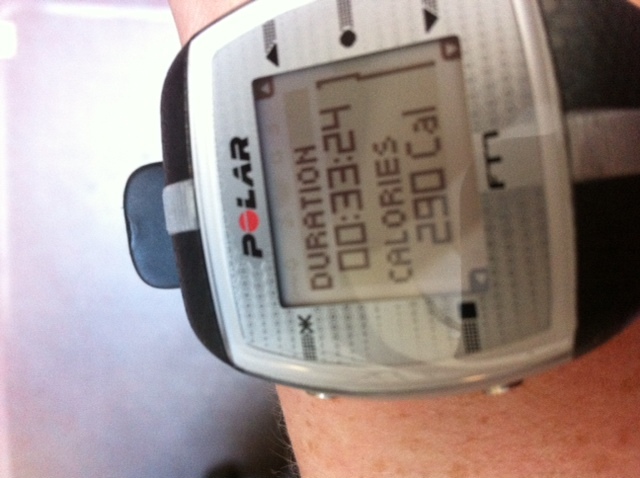 On Monday night I took a rest day and wanted something low(ish) in calories for dinner. I decided to try something new with the salmon. I made some foil “boats” and then mixed a few ingredients in a bowl: soy sauce, rice vinegar, and brown sugar. 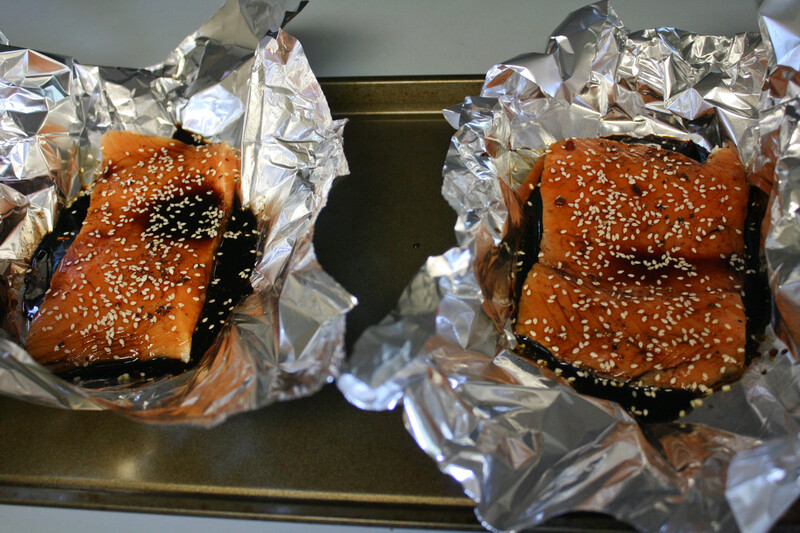 I brushed the foil with some sesame oil and then seasoned the salmon fillets with pepper and poured the soy sauce mixture on top. 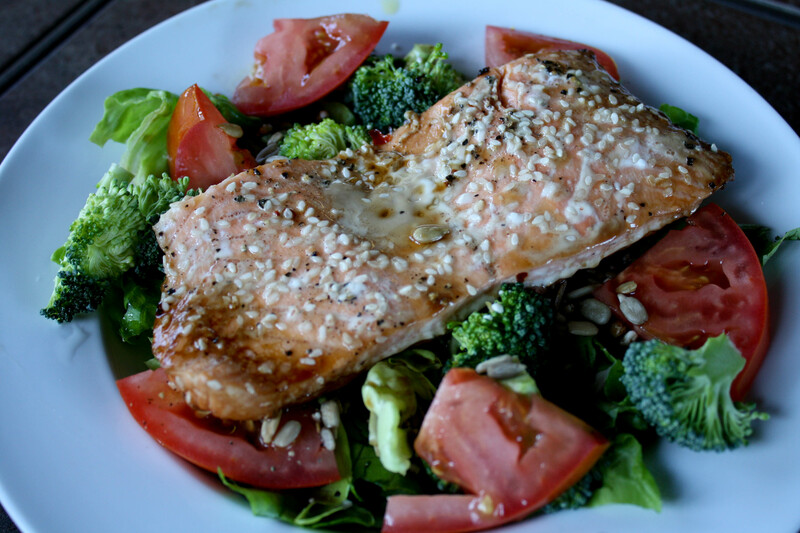 I sprinkled it with sesame seeds and baked the salmon for about 17 minutes at 375 degrees. While the salmon was cooking I made us salads. Butter lettuce and baby spinach, broccoli, tomatoes and some crumbled feta cheese. 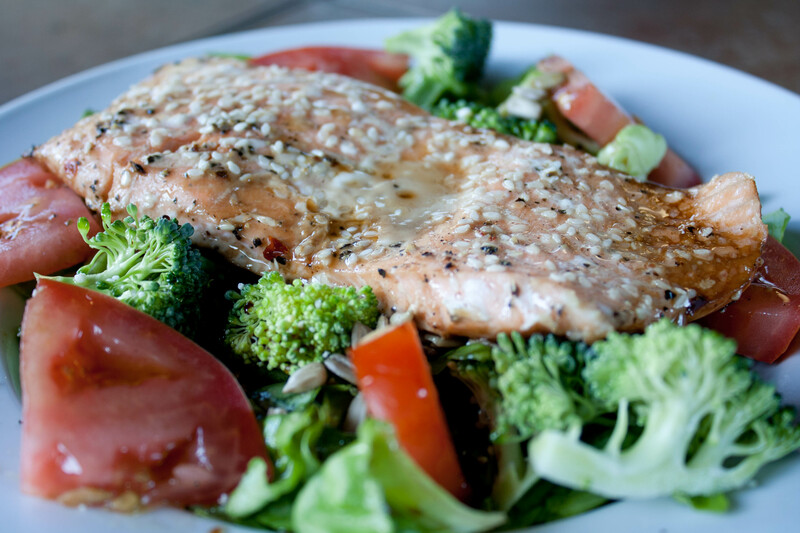 When the salmon was done I topped the salad with the salmon. I thought the dinner was good and healthy, but rather dull. Michael felt the opposite way and liked it a lot. He said sometimes it’s okay for salmon to be simple. The soy sauce mixture was not overpowering. Dinner was around 500 calories. I tried a different way to prepare chicken this time. I was going to bike to work and I knew I’d be hungry and tired when I got home and wouldn’t want to wait an hour for dinner to cook. I took three chicken thighs and put them in the crockpot. 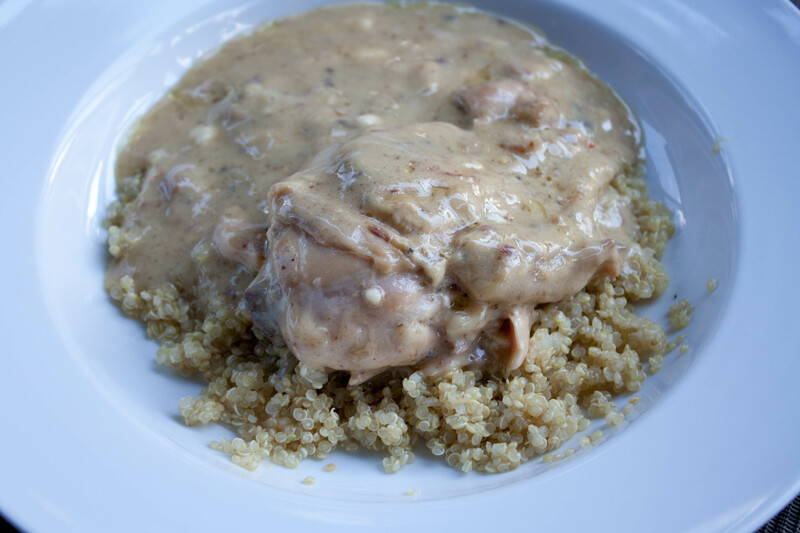 I seasoned with an Italian dressing dry mixture and then added one can of cream of mushroom and cream of chicken soup into the crockpot. Voila! It cooked all day long and the chicken fell off the bone. I know the gravy isn’t the most attractive color, but believe me when I tell you this was a great dinner and I’ll be making it again soon. Michael and I both devoured it and he declared it was the best chicken! I liked it a lot too but would do a few things differently next time. I’d probably use one of those half chickens or a few boneless chicken breasts instead. I think it would be easier and create more meat to go with the gravy. We also had quinoa instead of rice and while it was delicious, it didn’t quite work as well as rice would have. I had a green salad on the side and dinner was around 700 calories total. Apparently this meal was made all out of round food! But who cares what it looks like, it was a winning combination. 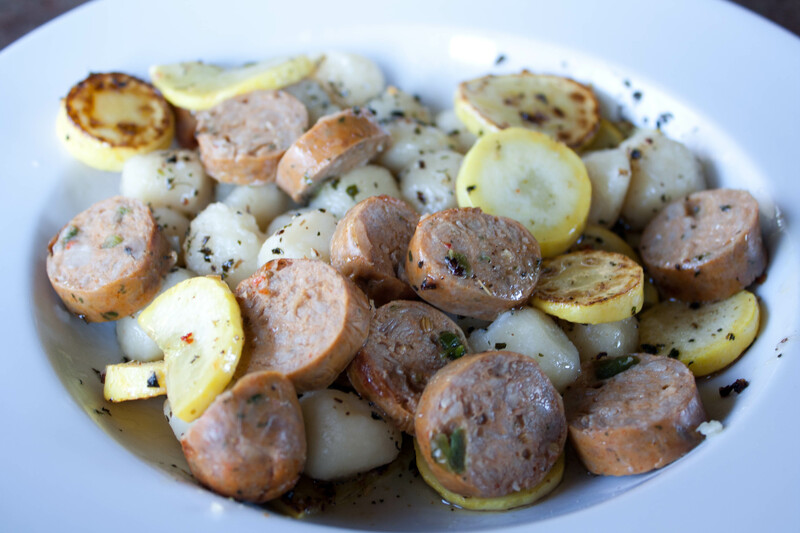 Michael grilled up some chicken sausages on the BBQ and I cooked a serving of gnocchi. Michael skipped the gnocchi since it isn’t gluten free and had leftover quinoa salad instead. I sauteed half of a squash picked from our garden, mixed it all together and drizzled some fancy basil olive oil over the top and dinner was served. I loved the combination and would make this dinner again.